This fall I’ve entered into combat with some of fallen nature’s most ferocious and merciless creatures. Thus far, they are winning the war. A couple months ago my castle (i.e. home) was invaded by a ruthless tribe of wasps or hornets (the latter is a subset of the species, as are yellow jackets, so they are all members of a single horrific animal family). They found a small, un-caulked opening into our attic . . . strategically placed just above our front door. I’m sure they had thousands of alternative bastions in the forest that surrounds our house but, being wasps, they knew this was the precise location from which they could wreak the most violent havoc. The initial fray was brief. I sprayed copious amounts of wasp insecticide into the crevice, in the hope of encouraging them to nest elsewhere. It appeared to act as an attractant. After it failed and added more recruits to their number, I donned armor and climbed a ladder after dusk when they had settled in for the night, and noiselessly attempted to close the space with insect-proof sealant. Alas, their sentinels were vigilant. They swarmed me, and pushed me off of the ladder causing me to land on my back and crash my head on the ground. Unfortunately, my long sleeved armor did not include a concussion proof helmet. Like a craven coward I lifted my bruised body from the rocky ground (nope, we haven’t planted a lawn yet) . . . and I ran for my life. All the while I was thanking God that I was only standing on the third rung. Aside from my bruises, they had only inflicted a single piercing wound—on my index finger. Of course, being predators, wasps carry a very nasty venom, and for the next week it failed to heal as the poison festered, despite diligent attention from my corpsman-wife. “I’m not touching you,” said Susan. “Someone is pulling me. Oh—oh—oh—stop it!” Everyone noticed that all the others’ faces had gone very white. “Yes,” said Susan. “Hold hands. Oh, I do wish it would stop—oh!” Next moment the luggage, the seat, the platform, and the station had completely vanished. Later, Edmund offers some wise advice in The Voyage of the Dawn Treader. He alludes to the deceptive natural and inherent ninja skills possessed by the killers. Just as I became resigned to my strategy with the vicious intruders, I became aware of a second army of insect brigands. This multitude had invaded the crawlspace under my home, through some weakness in the screens guarding my ventilation openings. Noting that I would not require a ladder to engage them in combat I foolishly thought, oh how you will rue the day you trespassed in my domain! I purchased a new screen to cover the entire opening, but their guards remained vigilant even during the night and before I could even begin the project, they swarmed and had me fleeing across our back lawn (yes, we do have some grass). Running recklessly in the dark I naturally stumbled and still bear some significant bruises. These would be bad enough, but two of the villains stabbed me with their poisonous stingers before I secured myself in the house. With the aid of my faithful border collie, I discovered an infiltrator who insidiously snuck into the castle proper clinging to my pants. I immediately dropped my leggings and proceeded to stomp on them for several minutes. I was thorough, walking repeatedly over every part of the crumpled clothing. Naturally, he survived. I did manage to rewrap him in the trousers and see to his demise. I am reconsidering my strategy now, and leaning towards placing commercial wasp traps directly outside the vent when the vermin reawaken in the spring. I’m also contemplating periodically banging a hammer near their hidden nest to disturb their rest during their hibernation. I haven’t determined yet whether this would be effective, as it is when interrogating terrorists, or whether it would simply be sadistic. Trying to learn their weaknesses (they don’t have any) I did learn one reason why wasps are so aggressive and merciless. They are almost all female! While queens alone reproduce, and they keep a few males handy for their sole role of mating and dying, the rest of the army consists of “asexual female workers.” These perform community duties such as building the hive, gathering food, feeding the young, and protecting the colony! Now, lest I be unfairly accused of misogyny, let me make clear that it is not their “feminine” nature that makes them violent. Rather, it is a corruption of their natural maternal instincts which cause them to guard their nest so belligerently that all rationally minded people desire their utter annihilation. The final book in the Chronicles has been my favorite ever since I first read the series forty years ago. I gained an even greater appreciation for The Last Battle when I read this description of the heavenly Narnia into which all of Aslan’s faithful were ushered. Tirian had thought—or he would have thought if he had time to think at all—that they were inside a little thatched stable, about twelve feet long and six feet wide. In reality they stood on grass, the deep blue sky was overhead, and the air which blew gently on their faces was that of a day in early summer. Not far away from them rose a grove of trees, thickly leaved, but under every leaf there peeped out the gold or faint yellow or purple or glowing red of fruits such as no one has seen in our world. The fruit made Tirian feel that it must be autumn but there was something in the feel of the air that told him it could not be later than June. “Here goes, then!” said Eustace. And they all began to eat. What was the fruit like? Unfortunately no one can describe a taste. All I can say is that, compared with those fruits, the freshest grapefruit you’ve ever eaten was dull, and the juiciest orange was dry, and the most melting pear was hard and woody, and the sweetest wild strawberry was sour. And there were no seeds or stones, and no wasps. Despite our repeated failings, the victory will ultimately be won by our divine Champion! You are seriously bugged. 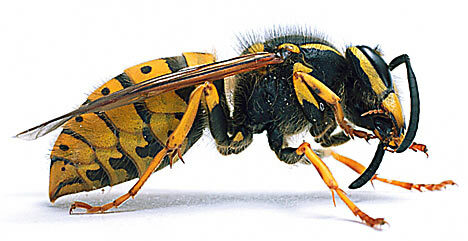 Bees are our friends, but red wasps and yellow jackets: seek and destroy. Yellow jackets attack and sting like crazy. Assorted banging near their nests would incite them to manic attacks, so it might be suicidal (for whom? Both?) – Yellow jackets will eat thorough sheetrock to get into a warm room. Really happened to neighbors. On the farm, my dad would locate a nest and toss gasoline on it which stuns them (fumes) and they drop so you can stomp them…caution: stingers will go through shoes….and it is gasoline. Mother hated it because dad never got stung, she usually did once they lost their nest and got mad. 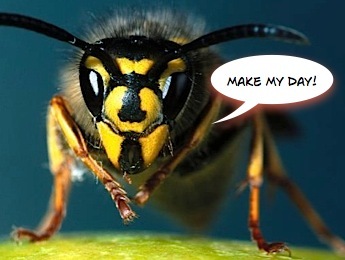 Yes, we love bees, which is another reason to hate the wasps–because some of them prey on innocent honey bees. Chewing through sheetrock! And stingers penetrating shoes! Well at least in the latter case it should cost the demonic creature its life. Fallen nature, tsk. Are we not taught as Christians to love our enemies? To turn our cheek? Oh, wait, that move would get you some truly puffy cheeks, don’t you think? When we moved to Guam, one of the guys unloading our household goods was stung on the eyelid by a “boonie bee” (actually a type of very aggressive wasp). In mere seconds his eye was swollen closed and looked like a golf ball was pulsating there. We urged him to go to the hospital, but he wouldn’t as the other workers informed me that he would not get paid if he did. At least we managed to force him to take some antihistamines . . .
Be careful as you wage your war! Wonder what the waspies will be like in the new creation. Friendlier, I hope! Hey, at least you got a cool blog post out of the ordeal. Good luck with your, um… houseguests. How lovely to be able to find a Lewis quote – several! – for every moment in life. Whenever I hear the term, “bluebottle” I think of Lewis and Wardrobe…the bluebottle on the windowsill. Yes, he impacts so many parts of our lives! Excellent writing, this made me laugh so many times as well as sigh. Sounds like you’ve been inundated though, maybe a call to the professionals is in order? This is frightening, insightful about their corrupted nature, and finally hopeful. It was interesting to read the allusions to wasps in Lewis’s work. Sorry you got hurt! Especially by falling backwards. Lord bless you! Hope it’s okay with you – I placed a temporary link to this on my front page. Yes, I’m pleased you linked to it… I’m always happy to have others smile at my misfortune. I hope you know I wasn’t smiling at your misfortune! Of course! After the swelling subsides, we’re usually the first ones to chuckle at these episodes in our own lives!